Go for a more casual look while still looking like a die-hard Oregon Ducks fan with any of the latest Travis Dye jerseys. 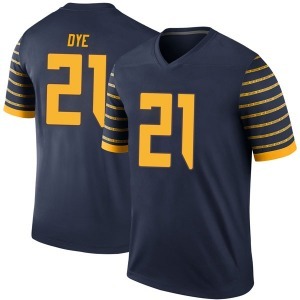 You can choose from home and away colors as well as Authentic, Limited, Game and Replica styles of jersey to find the perfect Travis Dye jersey for you. Our Travis Dye jerseys are available in men, women and youth sizes, so everyone can go to the game in the right colors. No matter what you're looking for, this is the place to shop for Ducks jerseys! Browse our huge collection of Travis Dye jerseys today and order your favorites to wear in support of the Oregon Ducks all season long! Cheer on your Oregon Ducks in this Travis Dye Nike Oregon Ducks Men's Replica Football College Jersey - Green from Nike! 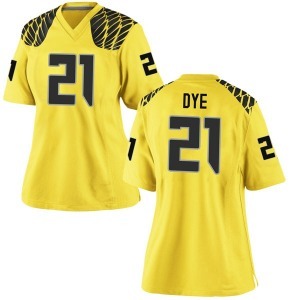 Cheer on your Oregon Ducks in this Travis Dye Nike Oregon Ducks Men's Replica Football College Jersey - Gold from Nike! 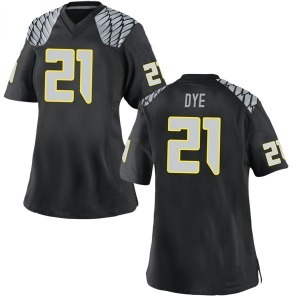 Cheer on your Oregon Ducks in this Travis Dye Nike Oregon Ducks Men's Replica Football College Jersey - Black from Nike! 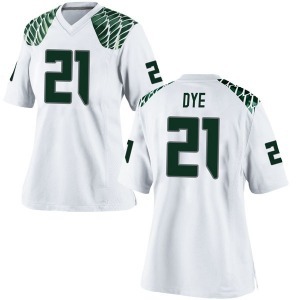 Look like the most passionate Oregon Ducks fan in the country with this Travis Dye Nike Oregon Ducks Women's Game Football College Jersey - White from Nike. Look like the most passionate Oregon Ducks fan in the country with this Travis Dye Nike Oregon Ducks Women's Game Football College Jersey - Gold from Nike. 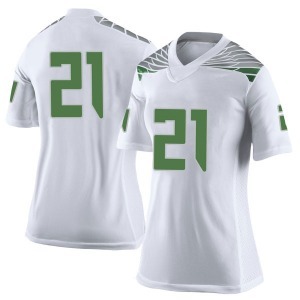 You'll feel like you're in the middle of the game when you put on this Travis Dye Nike Oregon Ducks Women's Limited Football College Jersey - White from Nike. Look like the most passionate Oregon Ducks fan in the country with this Travis Dye Nike Oregon Ducks Men's Game Football College Jersey - White from Nike. Look like the most passionate Oregon Ducks fan in the country with this Travis Dye Nike Oregon Ducks Men's Game Football College Jersey - Green from Nike. Look like the most passionate Oregon Ducks fan in the country with this Travis Dye Nike Oregon Ducks Men's Game Football College Jersey - Gold from Nike. Look like the most passionate Oregon Ducks fan in the country with this Travis Dye Nike Oregon Ducks Men's Game Football College Jersey - Black from Nike. 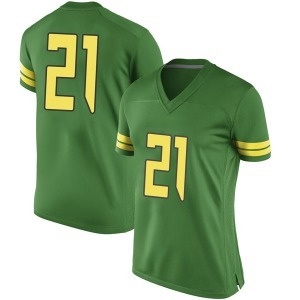 Cheer on your Oregon Ducks in this Travis Dye Nike Oregon Ducks Women's Replica Football College Jersey - Green from Nike! Cheer on your Oregon Ducks in this Travis Dye Nike Oregon Ducks Women's Replica Football College Jersey - Black from Nike! 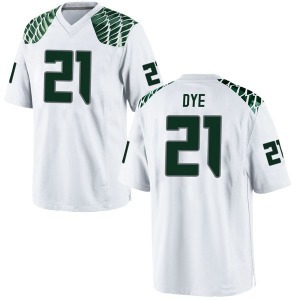 Look like the most passionate Oregon Ducks fan in the country with this Travis Dye Nike Oregon Ducks Youth Game Football College Jersey - White from Nike. 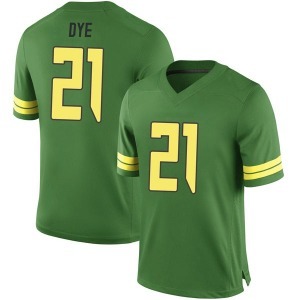 Look like the most passionate Oregon Ducks fan in the country with this Travis Dye Nike Oregon Ducks Youth Game Football College Jersey - Green from Nike. 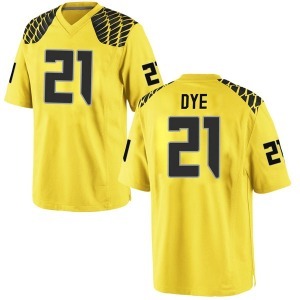 Look like the most passionate Oregon Ducks fan in the country with this Travis Dye Nike Oregon Ducks Youth Game Football College Jersey - Gold from Nike. 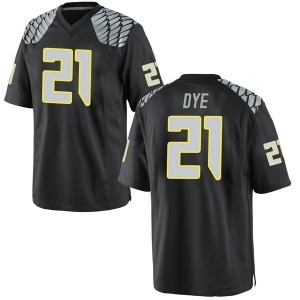 Look like the most passionate Oregon Ducks fan in the country with this Travis Dye Nike Oregon Ducks Youth Game Football College Jersey - Black from Nike. 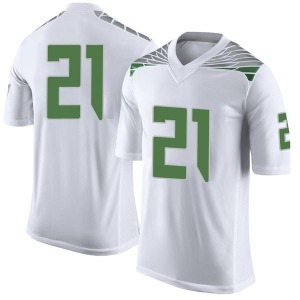 You'll feel like you're in the middle of the game when you put on this Travis Dye Nike Oregon Ducks Men's Limited Football College Jersey - White from Nike. Look like the most passionate Oregon Ducks fan in the country with this Travis Dye Nike Oregon Ducks Women's Game Football College Jersey - Green from Nike.